(WACO, Texas)—Consumers have good news to chew on this Thanksgiving as prices dropped 4.3 percent from last year. A traditional, Texas-style Thanksgiving dinner for 10 will cost $46.75 this year, according to the special Texas Farm Bureau (TFB) Thanksgiving Meal Report. The survey records the cost of 10 holiday staples—including turkey, stuffing, sweet potatoes, cranberry sauce and pecan pie. The 2017 report shows the average cost of this year’s holiday dinner dropped $2.10 from $48.85 last year. Survey shoppers found the price of a 16-pound, frozen, self-basting, young tom turkey to be significantly lower—down $1.76—from previous years. That’s due in part to a good production year for turkey farmers across the U.S. A recent report from the U.S. Department of Agriculture shows record amounts of turkey kept in cold storage. The extra supply, Boening noted, has encouraged some retailers to move the product at discounted prices while demand is high. In addition to the turkey, five other items decreased in price: fresh sweet potatoes (down .98 percent); cubed stuffing, herb seasoning (down 2.72 percent); brown and serve rolls, 12 package (down 1.09 percent); 9-inch pie shells, frozen (down 3.92 percent); whole milk (down 3.70 percent); and pecans, shelled and halved (down 0.95 percent). Although Hurricane Harvey took a bite out of the Texas pecan crop, prices remain close to what they were last year due to a large supply from above average crops in consecutive years. “Even though some pecan orchards suffered great damage from Hurricane Harvey, prices for this year, according to our survey, have held steady with last year’s prices,” Boening said. Texans will pay more for two Thanksgiving staples this year—jellied cranberry sauce (up 3.62 percent) and whipping cream (up 3.49 percent). TFB’s fourth quarter Grocery Price Watch survey, taken in conjunction with the 2017 Thanksgiving Meal Report, also indicated a slight decrease for household staples. Results from the quarterly survey of 16 common food products decreased 68 cents from $46.75 in the third quarter to $46.07 in the fourth quarter of this year. 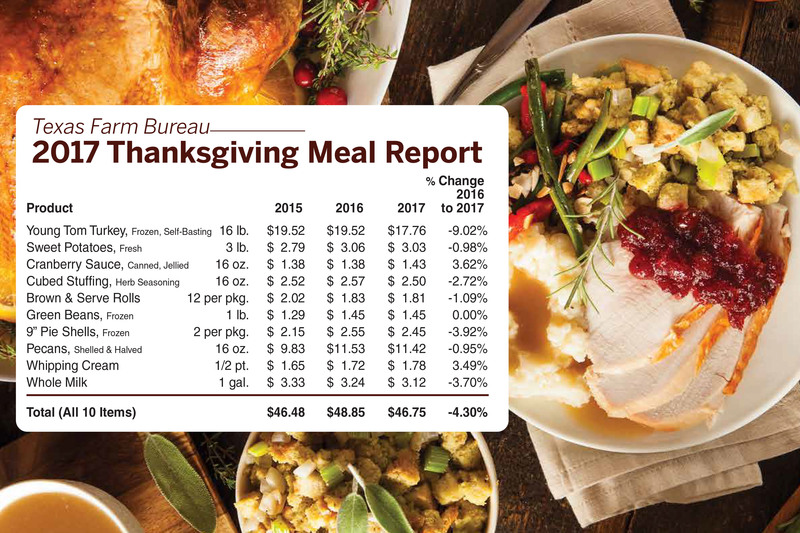 TFB’s Thanksgiving Meal Report and Grocery Price Watch prices were reported by 41 volunteer shoppers at grocery stores statewide from Nov. 2-9. TFB has released its Grocery Price Watch survey quarterly since March 2009.